Catalonia is embroiled in a bitter dispute with Madrid after it held a referendum on independence. It has plunged Spain into one of its biggest political crises since the restoration of democracy in the 1970s after decades of military dictatorship. So why does the north-eastern region want to ask its citizens whether they want to breakaway from the rest of Spain? Catalonia’s history goes back nearly 1,000 years and it is a region proud of its distinct language and identity. One of Spain’s richest regions, it enjoyed broad autonomy prior to the Spanish Civil War, but that was crushed during Franco’s era. Since the dictator’s death, Catalan nationalism has seen a resurgence. While the region was given back its autonomy in 1978, grievances around culture and language endure to this day. 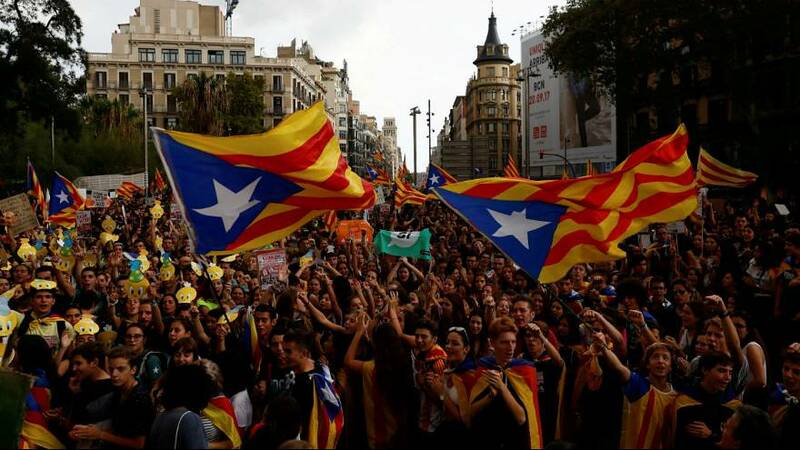 Most people in Catalonia are Catalan-Spanish bilingual but some believe the resurgence of the former is a threat to the country’s unity, according to Dr Mireia Borrell-Porta, an expert in European politics at the London School of Economics. She told Euronews: “There seems to be an obsession with unity in Spain, which is fine, but there is a confusion between unity and uniformity. “Some people see other languages as a threat to unity. During Franco it was like this, although that’s not to say I’m making a comparison. “There is this idea that every idea that isn’t considered Spanish is a threat to unity. So as a consequence the Catalan language is not well regarded. Tourism and industry has pushed Catalonia among the country’s richest regions. Some Catalan nationalists say, as a result, the region is being short-changed, claiming it pumps more money into Madrid’s coffers than it takes out. Of course, a nation redistributing wealth is not in itself unusual, but other autonomous regions in Spain, such as the Basque Country, doesn’t have to pay the taxes it collects into central government. Borrell-Porta said some Catalans felt infrastructure spending was too focused on Madrid and not enough was invested in their region. But Dr Robert Liñeira, an expert in electoral and referendum behaviour from the University of Edinburgh, said the idea of Catalonia having economic grievances with Spain was part of a nationalist strategy to draw more people into the independence movement. “There is an element of economic grieviances but they were put on the table in 2010, historically it was not a grievance used by Catalan nationalism. Experts say the biggest driver of independence is recent thwarted attempts for Catalonia to get more autonomy from Spain. But major parts of the statute were reversed by Spain’s Constitutional Court in 2010, much to the anger of Catalan nationalists. “I would say that this is one of the main reasons why pro-independence feelings are up again now,” said Borrell-Porta. “The statute was looking to solve the region’s economic and language grievances. “Before 2010 there was not many people favouring independence – it’s only been since then that it’s happened. “Of course, it coincides with the economic crisis so many people say that’s the reason, because the Catalans don’t want to give away their money. “That’s a misrepresentation and it forgets what happened, which was the constitutional court watered down the Catalan statue. Spain has declared Catalonia’s planned independence referendum illegal and vowed to stop it happening. Last week Spanish police detained more than a dozen Catalan officials and raided ministries of the regional government. Catalonia’s regional police – known as the Mossos d’Esquadra – have also been told to take control of any voting booths by Saturday, a spokesman for the Madrid government’s Catalan delegation said, in a bid to stop the referendum. Borrell-Porta said: “Now, many Catalans who weren’t for independence and didn’t think there should be a referendum are seeing how Madrid is seizing the Catalan finances and police; they are seeing how the Spanish public prosecutor is summoning all the Catalan mayors; they are seeing print presses raided and senior officials detained. “What the government did last week created an outrage in Catalonia,” said Liñeira. “And that’s not about money, we’re talking symbols.